Burgers, balls, patties, cakes – whatever you call them, I’ve expressed numerous times my excitement about this type of food. Not only it lets you bring together flavors and textures that make for one delicious, filling, and satisfying piece of food, but burgers, patties, and balls are also extremely convenient for lunch boxes, while travelling, or when you just need to impress a meat eater! I’ve had numerous occasions when meat eaters get shocked by how ‘realistic’ my burgers taste! 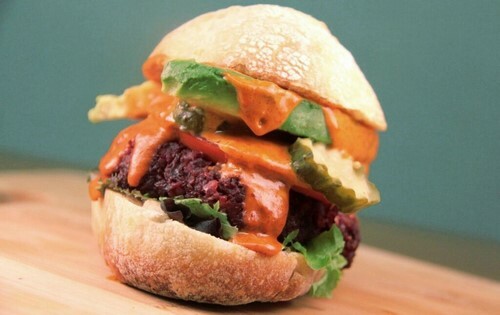 Not once have I had someone not drool over a vegan burger creation I’ve prepared and want more and more of it! My cooking skills are in fact my best advocate for veganism, which works like magic every time, and if you wish to perfect yours, too, I would be excited to share with you the 928 Tastiest Vegan Recipes I’ve put together for vegans, who want to create magic in the kitchen without having to spend hours on it! 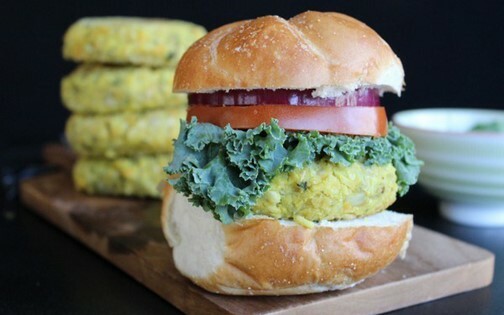 Back to the burgers – big, fat, juicy, delicious burgers can come together from veggies, too and here are some secrets on how to make that happen! Lentils have been a stand-in for meat since the beginning of time. Lentils are hearty and have the texture that can replace ground meat easily. They come in a variety of colors such as green, red, brown, and black. They cook up quickly, are inexpensive, and a small amount goes a long way. 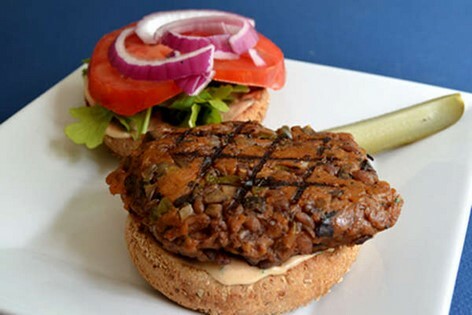 There is an amazingly delicious Green Lentil Chili Burgers with Creamy Dill Sauce recipe in the 928 Tastiest Vegan Recipes I’ve hand-picked from the world’s BEST cookbooks. Chickpeas are so amazing and versatile. You can eat them in salads, roast them until they are crunchy, or you can turn them into fabulous burgers. Think of falafels, but bigger. 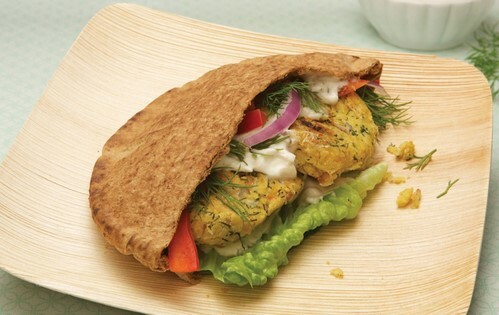 I make the most incredible chickpea burgers and serve them with Tzatziki sauce on top. On the other side of the color spectrum from chickpeas are black-eyed peas. These legumes, also known as pigeon peas, are perfect for burgers because they have a taste and texture that’s not too beany or grainy. Both chickpeas and black-eyed peas are very mild in flavor, so don’t be shy with the seasonings. 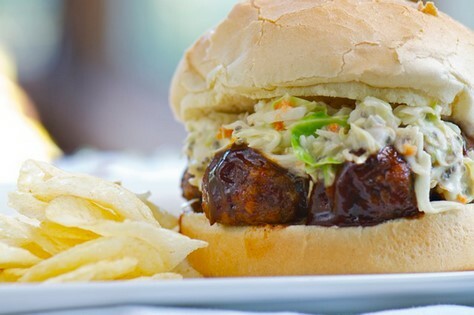 Beans are a fantastic ingredient to use in burgers. They are inexpensive, healthy, filling, and hold together really well. The flavors will vary depending on which type of beans you use – red beans tend to have a stronger flavor than white or black beans. If you want to try using white beans, I would suggest these Quinoa and White Bean Burgers. 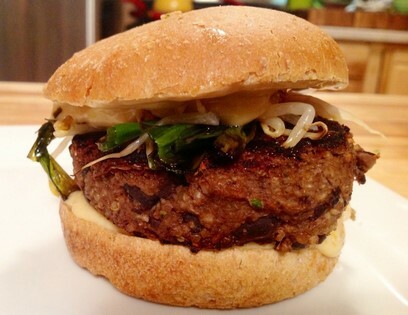 The dark red color of kidney beans makes for a “beefy” looking burger. Broccoli is one of my favorite vegetables; I could eat it every day. We all know broccoli makes a great side dish and we love putting it in stir-fries, but did you ever think of making a burger out of broccoli? Yes, you can! These Baked Broccoli Burgers with chickpeas and couscous are packed with flavor and topped with a homemade tahini dressing. Go green! When summer comes and you have so much zucchini that you’re not sure what to do with them all, send them to me. I’m serious, but if you want to keep it for yourself, try making burgers with zucchini. 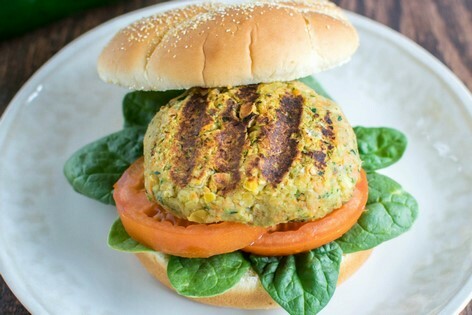 Shredded zucchini mixed with sweet summer corn make up for delicious burgers that are soft and fluffy on the inside and crisp and golden on the outside. Also check out these 12 Drool-Worthy Zucchini Recipes. Eggplant is a favorite vegetable of mine. It has a rich taste and it’s very versatile. It can be sliced, cubed, baked, sauteed or, you guessed it, made into burgers. 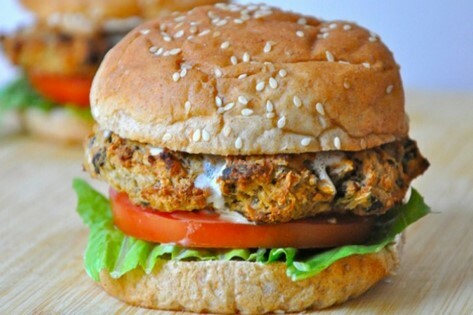 Eggplant burgers have a really decadent flavor, smooth and creamy. This drool-worthy Eggplant Crunchburger is filled with sauteed eggplant and vegan cheese and topped with a horseradish-mustard mayo and potato chips for extra crunch. Beets are nature’s candy. They are sweet, delicious, and perfect for salads, but they have another side to them. Beets are also earthy and work well in savory dishes – you can mix beets with black beans and walnuts to create amazing patties that are as delicious to eat as they are beautiful to look at. 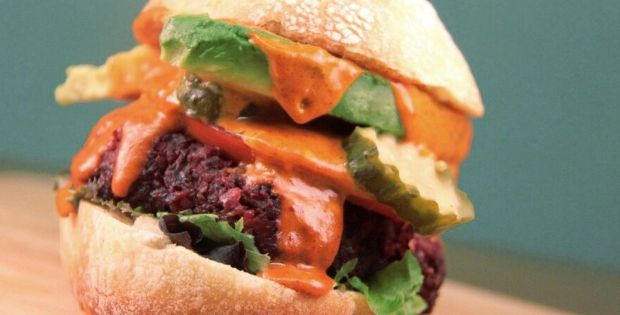 A perfect complement to beet burgers is a cumin-scented ketchup. When you want that meaty taste, that umami, mushrooms are the way to go. Their flavor is rich, earthy, and meaty, especially cremini or Portobello mushrooms. 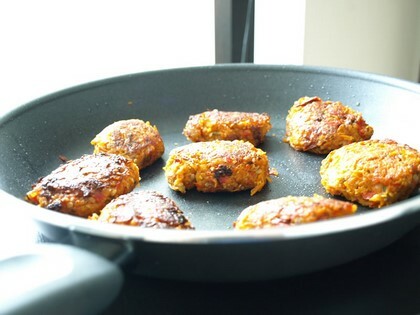 They are healthy and filling and can replace meat in any recipe especially burgers. Portobello mushrooms are even the perfect burger shape for instant Portobello Patties. Potatoes are not just for side dishes. They can be the main ingredient in so many dishes including burgers. Try these Delectable Smoked Tofu-Mashed Potato Cakes. You hear the word “pumpkin” and you probably think of Halloween, but pumpkins are great all year round. Think about it: depending on the size, one pumpkin can give you four or more cups of orange goodness. Pumpkin and other squash are hearty, sweet, savory, and filled with beta-carotenes. These Amazing Pumpkin Burgers are soft and delicious. These are just 10 suggestions of vegetables that can be used to make burgers, but the possibilities are endless. 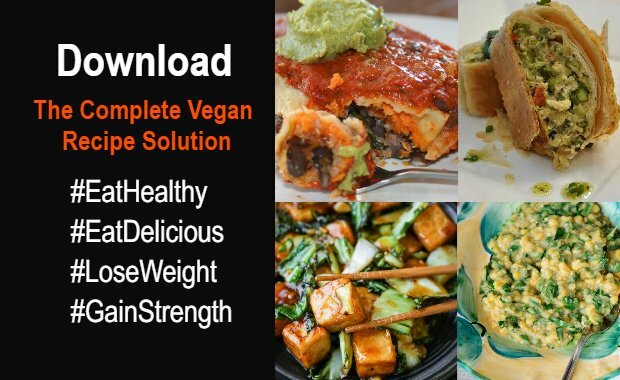 For more mouthwatering, yet SUPER healthy recipes Download The Complete Vegan Recipe Solution. We are a team of nutritional experts and vegan activists, who work 24/7 to bring you accurate, well-researched information that will empower you to make the right choices. Whether you are looking for in-depth nutritional advice, latest stories, or a mouthwatering recipe - this is the place!